The UPLB administration is now looking for a new director for the UPLB Museum of Natural History. The term of the current director, Dr. Juan Carlos T. Gonzalez, will end on 15 February 2018. The Search Committee, headed by Vice-Chancellor Rex B. Demafelis is now soliciting nominations from the unit's personnel, curators, stakeholders and other personnel from university units, and interested candidates. 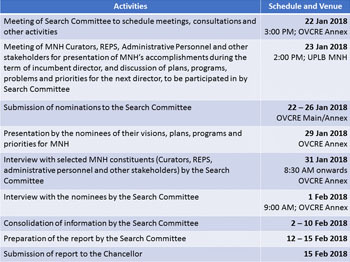 Nominees must possess the following minimum qualifications: Commitment to academic freedom and the values and ideals of the university; Distinction or outstanding academic credentials in the nominee's chosen field of expertise which should be along the lines of the unit's disciplines or fields; a Filipino citizen; Outstanding leadership qualities, administrative of managerial capability; Must be willing to serve; and Must consider resource generation as an important function of the position. 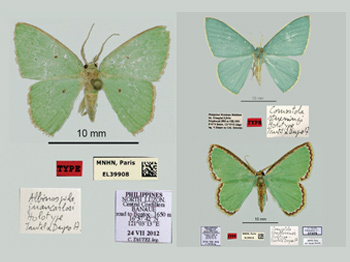 Three new species of geometrid moths have been recently described through the collaborative work of the French taxonomist, Claude Tautel and UPLB Museum of Natural History curator, Dr. Aimee Lynn A. Barrion-Dupo. The first species, Albinospila juancarlosi, was first collected in Banaue, Ifugao in 2012 and further collected from several localities in Luzon and Romblon islands. 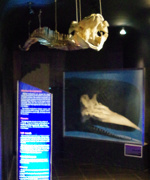 It has been named after the current director of the UPLB Museum of Natural History Dr. Juan Carlos T. Gonzalez. According to the authors, this species resembles the larger A. variifrons except in the color of the border of the wings. A. variifrons was previously placed under the South American genus Racheospila, and has been re-classified under the genus Albinospila. Most often, stored products pests are insects which can cause contamination thereby making the goods unmarketable or lower in value. Because the economic significance of stored product pests highlights the need to collect and identify them properly, the training focused on the identification of different insects thriving in stored products and the demonstration and practice of various preservation techniques for display and voucher specimen collection. The Museum of Natural History served as the partner of the Department of Environment and Natural Resources-Biodiversity Management Bureau (BMB) in a learning event held last 20-24 November 2017 in Alaminos City and Mabini, Pangasinan. The partnership enabled the fruitful conduct of the Learning Event on Cave Biodiversity Assessment for 29 DENR field officers coming from various regions of Luzon. The participants were from DENR Regional Offices 1, 2, CAR, 3, 4A, 4B, 5, and NCR; Palawan Council for Sustainable Development; and the BMB Central Office. Known for having the largest mossy-pygmy forest in the country, Mt. Hamiguitan in Davao Oriental is recently lauded for its remarkable ant diversity. Officially named Mount Hamiguitan Range Wildlife Sanctuary, the mountain as been declared as a UNESCO World Heritage Site in 2014. 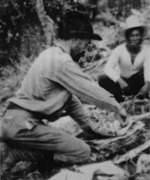 MNH researcher David Emmanuel General and his colleague Mr. Perry Archival Buenavente from the Philippine National Museum recently published an updated checklist of ants found in Mt. Hamiguitan. 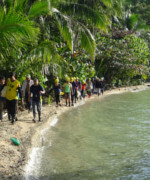 This includes 13 species that are newly recorded in the Philippines. 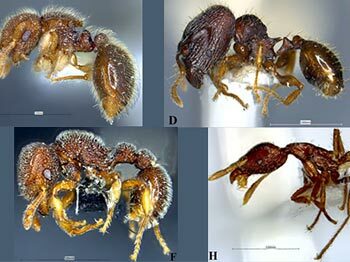 The researchers collected a total of 1,677 ants belonging to 51 genera and 8 subfamilies. Since this was the researchers' first systematic transect study of the locality, most of these records represent the first records for Mt. Hamiguitan. 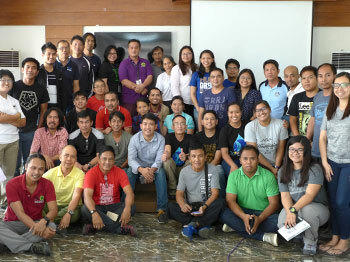 Ten curators and staff of the UPLB Museum of Natural History were among the invited experts in a consultation workshop to refine the methods for assessing biodiversity in urban ecosystems organized by the Department of Environment and Natural Resources- Biodiversity Management Bureau (DENR-BMB) and AVILON Wildlife Conservation Foundation, Inc. in Rodriguez, Rizal last on 20-22 September 2017. 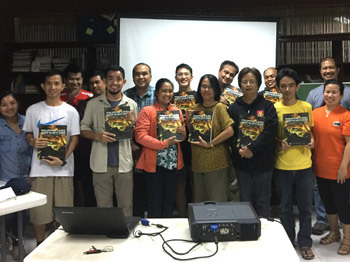 Among the experts who reviewed the methods for different taxa include Prof. Phillip A. Alviola, Prof. Judeline C. Dimalibot, and Mr. James Alvarez for mammals; Dr. Ireneo L. Lit, Jr., Dr. Sheryl A. Yap, Mr. Cristian C. Lucanas for arthropods; Dr. Leticia E. Afuang for amphibians and reptiles; Dr. Juan Carlos T. Gonzalez for birds; and Prof. Pastor L. Malabrigo, Jr., and Dr. Nelson M. Pampolina for flora.